Now more than ever, academic libraries are being asked to demonstrate value to their institutional stakeholders, funders, and governance boards. 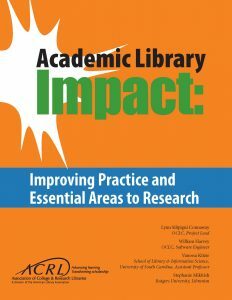 Academic Library Impact builds on ACRL’s 2010 Value of Academic Libraries: A Comprehensive Research Review and Report and the results of the subsequent Assessment in Action program. It demonstrates how libraries are now measuring library contributions to student learning and success, and recommends where more research is needed in areas critical to the higher education sector such as accreditation, student retention, and academic achievement. a full bibliography of the works cited and reviewed. All components were produced in partnership with OCLC Research and include analyses of library and information science (LIS) and higher education literature, focus group interviews and brainstorming sessions with academic library administrators at different institution types within the United States, and individual interviews with provosts. Building on established best practices and recent research, Academic Library Impact clearly identifies priority areas and suggests specific actions for academic librarians and administrators to take in developing programs, collections, and spaces focused on student learning and success. It includes effective practices, calls out exemplary studies, and indicates where more inquiry is needed, with proposed research designs. It identifies the next generation of necessary research to continue to testify to library value. This new report is a significant milestone for ACRL’s Value of Academic Libraries initiative and for the profession. The report is now available as a free PDF for download, and a print edition for purchase will be available through the ALA Store in October 2017. A companion online tool, “Visualizing Academic Library Impact: The ACRL/OCLC Literature Analysis Dashboard” helps librarians and researchers filter the existing literature for studies most relevant to their research interests and visually explore the literature and other data in the form of charts and graphs. 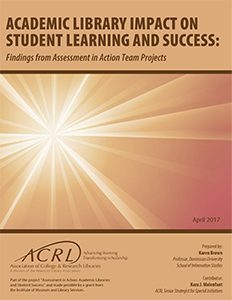 Through a new report issued by ACRL, “Academic Library Impact on Student Learning and Success: Findings from Assessment in Action Team Projects,” the higher education community now has compelling assessment findings that tell a strong story about the multiple ways that academic libraries are contributing to student learning and success. 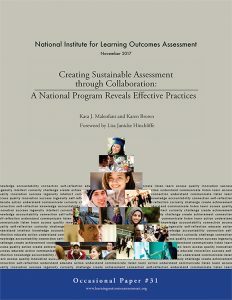 The report focuses on projects completed during the third and final year as part of the program Assessment in Action: Academic Libraries and Student Success (AiA) from April 2015 to June 2016. Teams from more than 50 campuses completed assessment projects and reported on them individually (fully searchable online), and this synthesis builds on past findings from an additional 150 projects completed during the first and second years of the AiA program as context. A new day-long traveling ACRL workshop builds on the AiA curriculum with a focus on strategic and sustainable assessment. Learn more about how to bring this and other ACRL licensed workshops to your institution, chapter, or consortia. A forthcoming print volume, Shaping the Campus Conversation on Student Learning and Experience: Activating the Results of Assessment in Action, will describe the entire AiA program in greater detail. The volume, to be published by ACRL in fall 2017, will provide context, offer reflections from team leaders, and serve as a culminating capstone for the three year IMLS-funded program.